The Conservative Woman has obtained an advance copy of Sir Nick Clegg’s first presentation on behalf of Facebook. Remember how we fought fascism. Not by confronting them. That way madness lies. We beat fascism the other way. In hindsight. Find out who’s won. Then rewrite the history books. That is my policy. I myself was an outsider. My ancestors came to Britain from France. He hadn’t a groat to his name. All he wanted to be was a surgeon for the National Health Service. And yet, and yet. He was met by nationalists. Yes, they had them back then, in 1066, led by the Nigel Farage of the day. A man called Harold. But I’m proud to say my great-grand-pere was on the right side of history. That was one in the eye for Harold. And after the battle, Pierre Clegg got a job in a new industry. Making copies of the Bayeux Tapestry. That was the new media of the day in Olde Englande. And like Facebook, it had its critics. But my ancestor’s wall-mounted form of mobile media revolutionised storytelling. It was the forerunner of today’s compelling social media content that has done so much to democratise society and improve public life. So don’t tell me that LibDems don’t know about technology. And innovation. And positioning. 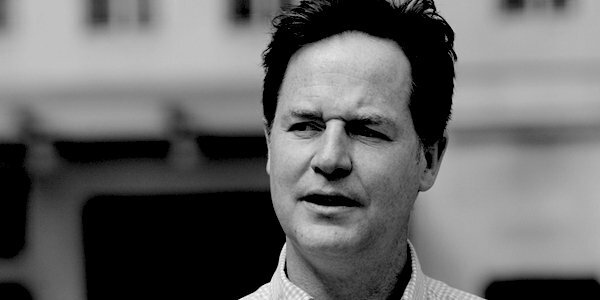 I was the first Clegg ever to go to Westminster School. Before that, the Clegg boys all had to go to the local Eton. OK, my parents were not there in Cable Street when the Blackshirts were confronted. But they were not far away. In the City of London, keeping close tabs on the situation. Hedging their bets. And let me tell you this – they made bloody sure that they – and all their premium clients – would be on the right side of history. But only when the time was right. Let us pick our fights sensibly. As you say in the IT industry, let’s make strategic alliances. I tell you this. The days of casual laissez-faire alliances are over. The days when you could make nonsensical alliances, just for the hell of it, are gone. I’ve been warning about this for years, and I’m glad to say Facebook agrees. Strategic alliances are crucial. If we are going to fight, let’s fight against Straw Men. Let’s engage sensibly in winnable fights, with beatable opponents. The imaginary racists. The bogus Brexit supporters. The outdated cliches. Let’s dismantle arguments that nobody is making. Let’s ridicule opponents for things they never said. Let’s not be afraid to change sides when it looks convenient. History is written by the winners. And we must be on the right side of history. Listen, there is no point in opposing evil until we get a clear idea about which side is going to write that history. They can decide who is evil. And then our job is to back them, one hundred per cent. Working together in partnership. Britain is not an island. I’m sure you will agree that racism is terrible. Motherhood is great. And apple pie tastes brilliant. Controversial words? Yes, I make no apologies for that. Unless forced to. But I will make no apology . . . for just as long as my advisers tell me not to. And my advisers’ advisers. But we should never lose sight of the fact that history is written by the winners. And when they emerge, I shall be there. At their side. Doing whatever has to be done to get my feet under the table. Go back to your work stations and prepare your algorithms for surveillance. And to the Far Right in Britain, I have this message from Facebook. We can take away your privacy. We can take data from your children. We can take away your freedom. But you will never, ever, take away anything from us in tax. Next articleJust what – or who – is driving Theresa May?